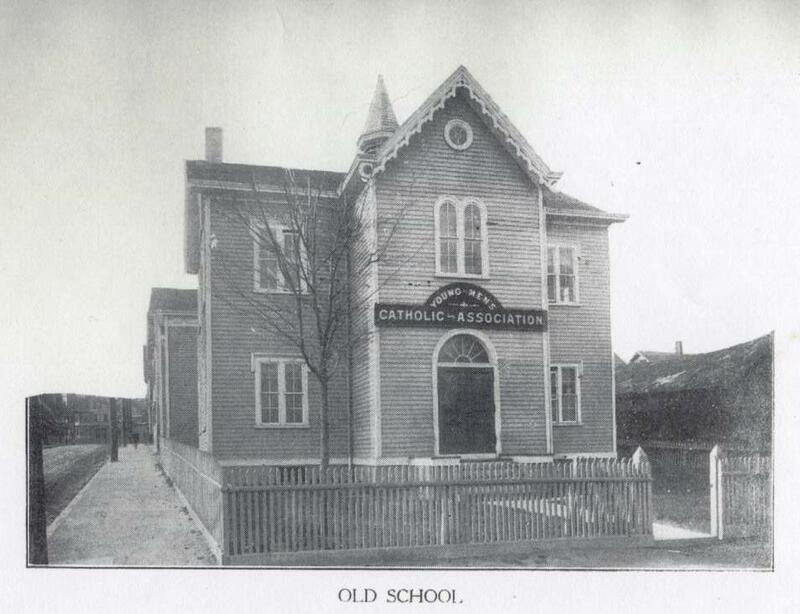 The following was submitted by Bob Ryan, and is an extraction of names and references to religious events that were published as part of St. Mary’s history in 1929. There is no other information available in this book other than the information published here. How many Catholics there were in this vicinity then, it is difficult to determine. Very few entries in the Baptismal registers of Boston give evidence of residence in either Pawtucket or Providence. Down to the year 1837 there were no records kept in Providence. From the Boston records we quote this information. In May 1813, Bishop Cheverus baptized in Providence, Sarah Cottrell, the wife of Francis McGill; in 1814 two infants named Rumford, one named Walsh and one named Condon. The names of some of the sponsors were James Lawlor, Mary McCabe, Owen Carroll and Rose Lackin. In the Bishop’s Confirmation Lists for 1813 find the names of Rose Lackin, Daniel McGowan, Luke Higgins, Sarah McGill and Amy Dillion. In January 1814, he confirmed William Jordan and Mary Jordan. The next entry is in June 1823, when Bishop Cheverus baptized in Providence Mary Ann Develin, the daughter of Patrick Develin. 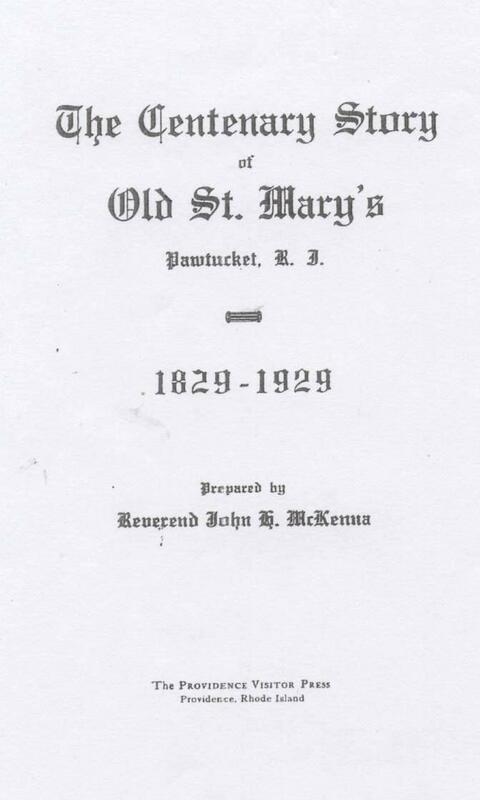 In the same year he baptized in Pawtucket Jane Ann, child of James Morrison; Mary, child of Michael Wall; Edward, child of Arthur McCarthy; Mary Ann, child of Francis Asley; John, son of Patrick Gillespie. The sponsors of these children were: James Caffrey and Margaret Develin, Lydia King, Patrick and Bridget Develin, Janes Caffrey and Margaret O’Connor, Charles and Sarah Hinds. From the time of his return to Providence  until 1840, Father Corry seems to have had the direction of the Pawtucket parish. 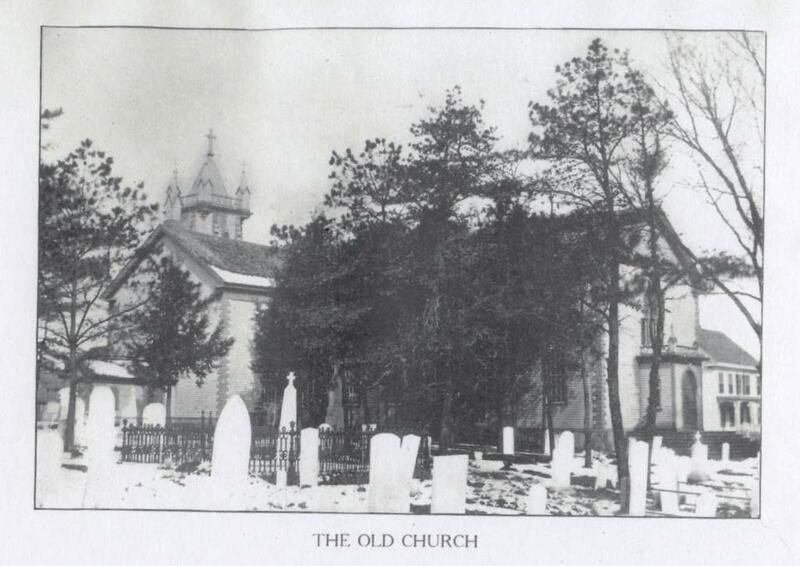 An interesting document of that time has recently (1925) been received from … [the] pastor of St. John’s Church, Rensselaer, N.Y. Father Corry was also the founder of that parish. It consists of leaves, torn from a diary of Father Corry, and giving a record of burials in St. Mary’s Cemetery from 1838 to 1840. There are many more entries. These serve to give the names of some of the early residents. … he was a native of County Tyrone, Ireland. Coming to this country as a youth, he studied in Mt. St. Mary’s College, Emmitsburgh. Later he made a seminary course in Cincinatti, and was ordained by Bishop Chabrat for that diocese. Father Delaney died in October 1879… He was buried in St. Mary’s Cemtery. … Father Halligan was born in the parish of Ardagh, county Longford, Ireland, in 1841. After making his classical studies in his native country, he came to the United States in 1860.